A Barunissa is located in Castiglione di Sicilia, on the Etna volcano, immersed in the greenery of the homonymous Park. His name is always used by the locals to identify this piece of paradise, which covers 100 hectares within a forest, just 20 km from beautiful Taormina. In Barunissa offers its guests a relaxing environment, comfortable rooms, a beautiful forest and lots of nature. A true oasis of peace and serenity to rediscover themselves, their well-being and contact with nature. To travelers on their way stop off here is in fact welcomed by brooms, fruit trees and a lush forest: the hotel is set within a forest of pine and chestnut trees, which make it the ideal place to relax, finding some time and energy and experience the deep sense of Nature. The encounter between past and present was the case in respect of the vocation of the place and the surrounding nature; and a meticulous restoration aimed at preserving the existing architectural features, with particular attention to the conservation of the environment and the tools of the past, did this reception dedicated structure. The main house and the houses, stables and warehouses for tools, transformed into comfortable guest rooms, the press room and the "Conzo", and the cellar with ancient barrels perfectly preserved chestnut, offer accommodation that draws in unequivocally the atmosphere and the ancient local traditions. The old winery and other spaces once used for winemaking are home to the reception and the common room, which blend with the environment, embracing guests in a warm and immersed in lush nature, away from city noises. This is where are served tasty vegeteriane breakfasts, pastries and breads, also homemade with seasonal produce and 0 km, such as honey, produced by bees just within the background, often used for popular apple pies and donuts Gisa mom. The rooms available to guests are characterized by a simple elegance and intimate and comfortable atmosphere and are equipped with private bathroom with shower, complimentary toiletries and towels, hair dryer, TV, refrigerator and a safe. The 100 hectares of A Barunissa are right in the heart of the Etna Park, looking out on the Peloritani and Nebrodi mountains, and offer a picturesque landscape: the green mountains, the majestic Mount Etna and the Alcantara River Park, which, articulated in small waterfalls, with its crystal clear water rich in trout runs through the valley before diving in the Ionian Sea. A Barunissa is ideal for those who want to get away from the hustle and stress of city life, and for those who want to relax and recharge with clean energy that only the mountain air can give. In the wide forest that stretches around the structure, in fact, guests have the opportunity to travel along long paths with various levels of difficulty, which wind through uncontaminated areas of land by walking, hiking or mountain biking. Whatever the season, guests are enveloped by the warm and intense fragrance of pine trees; in spring they will also be surrounded by the green of the chestnut trees, which then will bloom in early summer, and then turn yellow and tinged with reddish streaks in the fall. Nearby, among others, are apple trees, walnut, wild strawberries, which grow wild under the trees, shrubs and native flowers from the many colors and fragrances: the yellow of the broom to the deep pink of red valerian from May to July, cyclamen pink and purple crocuses in the fall, and many others. In warm weather, you can find refreshment while walking in "trazzere" (mountain paths) of the forest, while in this corner of the world autumn acquires a unique charm and suggestive: the earth, bathed by the first rains, does smell of their own wealth and fertility, and you pass by the many shades of bright green to brown to various shades of yellow and orange. In summer the hotel organizes tours Marine Protected Area "Cyclops Islands" of Acitrezza, to be inspired by de "places I Malavoglia" by Giovanni Verga and admire the Faraglioni and the Lachea Island. Fans and the curious diving or snorkeling can participate in diving excursions or try the baptism of the sea, thanks to the collaboration with SSC diving, the confidence of the structure diving center, which provides services and equipment, and with the dell'ETNADIVE guides. You can also organize tours by jeep or horseback on the Etna volcano and Nebrodi Park on request. For lovers of cultural and gastronomic tourism, are available many routes of great interest; thanks to the central position of A Barunissa guests can plan on the advice of the staff a wide and varied number of excursions. Finally, where lovers of fine food and wine of high quality, will find in many area of ​​the most important wineries of Etna, some of which, by reservation, opening their cellars to fans and tourists interested. We are Isabella & Giacomo. You are welcome in our Country House. We had a wonderful experience in this magnificent place at the foot of Etna: the setting, quiet and peaceful in the middle of pine trees and vineyards. The rooms, spacious and quiet, with a bottle of local wine waiting for us when we arrived and everyday a basket of local pastries. The estate, an old winery, full of atmosphere and beautifully renovated, inside and outside, where we could lounge. The breakfast, delicious and plentiful (with exceptional honey from the estate!). And finally, the owner, Isabella, who treated us more like family than simple guests and couldn't do enough to help us. Everyday, she made sure we went away with a packed lunch made up from delicious pies, omelettes and pastries left from breakfast. We can't thank her enough for her kindness and wonderful hospitality! We'll definitely visit her again when we travel back to Sicily! Thank you! A BARUNISSA is the ideal place to rest, sleep and live in the middle of the Etna Park, a World Heritage Site. 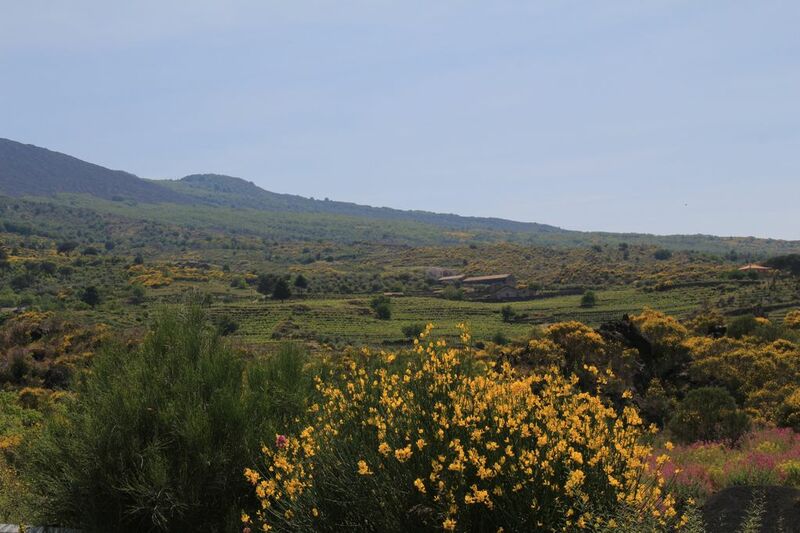 From the hotel it is possible to visit the best wine cellars of the Etna area, golf club and the nature trails of Etna to do in promenade, trekking, skiing, mountain biking. La tariffa minima s'intende per un massimo di n°04 ospiti. La struttura non è provvista di ristorante. Proponiamo un tipo di cucina casalinga su prenotazione e per pochi ospiti. Degustazioni su richiesta.